The Istituto Svizzero is pleased to present a two-person exhibition by Swiss artists Manon Wertenbroek (Paris) and Shirana Shahbazi (Zurich), “Capovolto”. This exhibition plays with the suggestive nature of its words with the title—suggested by Wertenbroek—Capovolto, translated as Overturned, as a guiding principle. Perception of the space is turned upside down thus destroying the points of reference within the architecture of the Istituto Svizzero as we know it. The two artists create an immersive environment: colour is present throughout, opposite sides of the gallery are flanked by two wall paintings by Shirana Shahbazi, and four engraved mirrors by Manon Wertenbroek create constant moving reflections disorienting the viewer. The works’ appearance is constantly in flux. Both artists investigate and play with photography’s technical restrictions and set new ways for its use. Wertenbroek’s Courtly Love, Amaryllis, Mixed Feelings Melody, and Dewdrops (all 2018), have been composed with a reiterated process of engraving and partial printing on PVC mirror. These works which have been intervened upon again with silkscreen varnish, bring forth texture and depth, thus distancing themselves from their photographic origins. The mirror’s reflection shows us both what is real what is invented creating new visual possibilities. Along with Shahbazi’s wall paintings, two monochromatic C-prints: Raum Rot (2017) and Raum Blau (2017) hang on the walls of the space. The images and coloured surfaces oscillate between surface and depth, catalysing the emergence of new conceptual spaces. This exhibition is linked to the Pro Helvetia programme Promotion de la relève dans les arts visuels, through which the two artists had the chance to meet and collaborate. Born in Lausanne in 1991, the Swiss/Dutch artist Manon Wertenbroek obtained her Bachelor of Arts in Photography in 2014 from ECAL (Lausanne University of Art and Design). Since graduating, Wertenbroek has been showing her work in gallery spaces from The Netherlands to Belgium, Italy to France, with appearances at Art Basel, Amsterdam’s Foam Museum and Rome’s Swiss Institute. Her work focuses on portraiture as a symbol and vehicle to explore questions of introspection, identity, social interaction, and emotion. She often builds installations using engraved mirrors and painted reflective materi- als which are then combined with neon-colored lighting and finally fixed using photography. Wertenbroek’s potency lies in her ability to mix both abstract and representational forms by using varied techniques to express her and other people’s emotions. Her work has been featured in publications around the world including the Guardian, Mousse, British Journal of Photography, Foam Magazine, i-D, LensCulture and more. 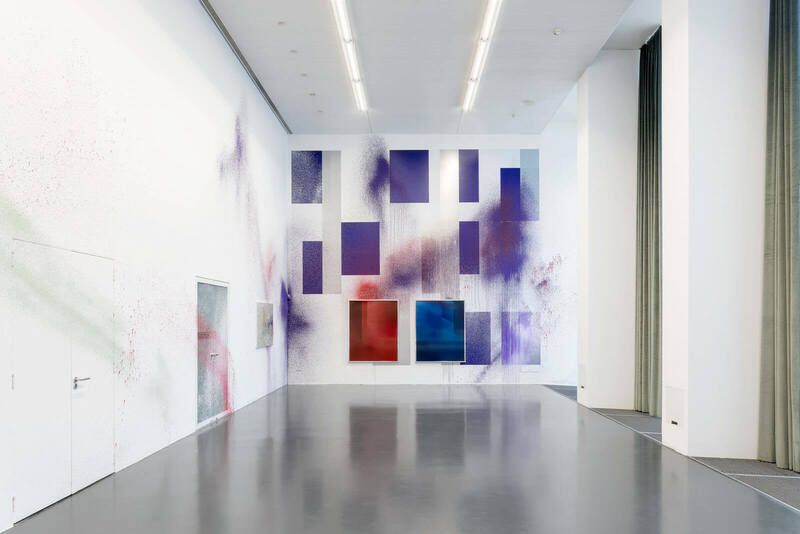 In January 2017, her first solo show opened at Coalmine in Winterthur, Switzerland. The same year she was awarded a Swiss Art Award from the country’s federal office of culture. Shirana Shahbazi was born in 1974 in Tehran. She studied photography at the Fachhochschule Dortmund in Germany and Hochschule für Gestaltung und Kunst in Zurich. Shahbazi lives and works in Zurich. Recent solo exhibitions include: Kunsthaus Hamburg (2018), Fotogalleriet, Oslo (2017), Galerie Peter Kilchmann, Zurich (2017), KINDL- Zentrum für zeitgenössische Kunst, Berlin (2017), Camera Austria, Graz (2016), Kunsthalle Bern (2014), New Museum, New York (2011) and Fotomuseum Winterthur (2011) among others. Her works are included in the following public collections (selection): Museum of Modern Art, New York, Fotomuseum Winterthur, Migros Museum für Gegenwartskunst, Zurich, Frans Hals Museum, Haarlem, Tate Modern, London, UK and MUSAC, Museo de Arte Contemporáneo de Castilla y León to name a few, as well as in several private collections worldwide.